The Mesolithic Settlement of Sindh (Pakistan): New Evidence from the Khadeji River Course, an article by Paolo Biagi is another piece of the puzzle of habitation in the Indus delta long before the ancient Indus civilization. Clues come from the research at Khadeji River sites, just north of Karachi, which date to the Mesolithic era (roughly 9000-6000 BCE, so 3,500 years before the ancient Indus civilization was at its peak). Dr. Biagi has been at the forefront of this research for decades, and puts the work of the Italian Mission with which he is associated in context of the larger scope of discoveries in Sindh and their importance for understanding the long and rich human experience in the area. The surveys carried out by the Italian Archaeological Mission in the Thar Desert (Upper Sindh, Pakistan), and the study of the chipped stone assemblages collected by the late Professor A. R. Khan on the Mulri Hills (Karachi), have contributed to the definition of the characteristics of the Mesolithic assemblages of this region of the Indian Subcontinent. At present two important groups of sites are known whose distribution covers the two aforementioned territories. In the Thar Desert, east of the caravan town of Thari, the sites are located inside depressions between the highest sand dunes that surround old freshwater basins. East of Karachi many sites have been found in the Mulri Hills, a small elevation rich in springs, between the Malir and Layari Rivers both flowing into the Arabian Sea, some 15 kms to the south. Preliminary surveys carried out along the banks of the Khadeji River have shown that Mesolithic sites existed also along this watercourse. An AMS date obtained from a marine bivalve collected from site KDJ-1 yielded a late ninth millennium BP result. 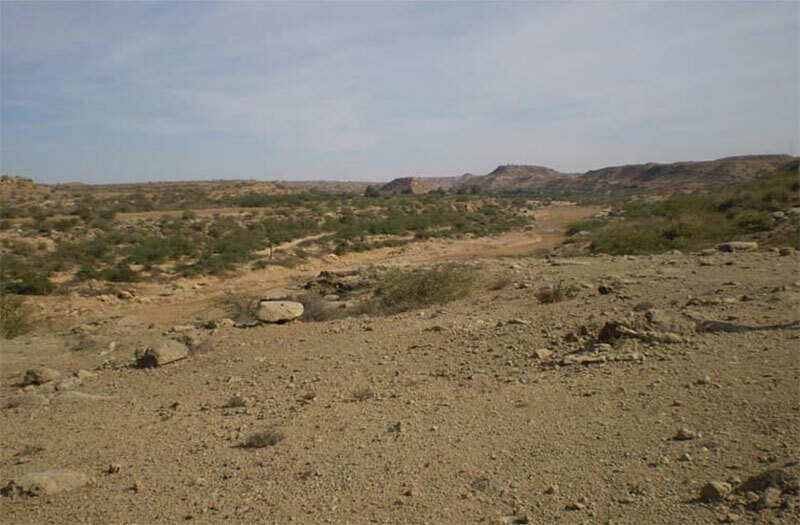 This paper describes and discusses the Khadeji River Mesolithic sites recovered by Professor A. R. Khan in the 1970s in the general framework of the new discoveries made in Sindh.